Many decades ago, the legendary banker, J.P. Morgan, was asked about how he lent money. His reply is as precious as gold to every Investor. J.P. Morgan replied: "I lend money against character." What is true in banking is also true in equity markets. Investing in the equity of a company is like entering into partnership with the promoter of the company. This partnership should be evaluated just like marriage. The basis of such a partnership should strong fundamentals and reasonable pricing. Equity Investment Is a partnership with the promoter. Would you enter into a partnership with someone who does not have a respectable character? Would you give money to someone you can’t trust? When we have to give money to our near and dear ones for starting a business, we ask them countless questions and put them through a grilling test. 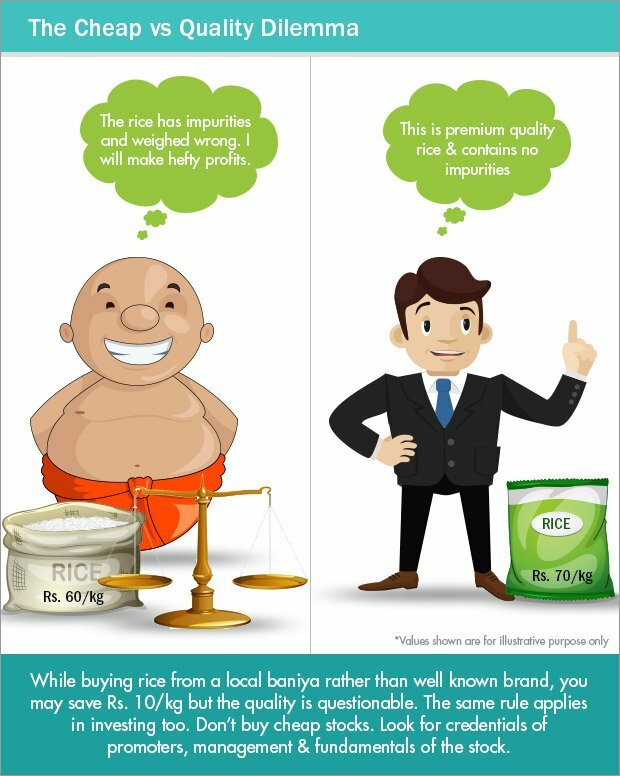 Even while buying our daily goods – say rice we prefer to buy from a super market from respected brands rather than buy from a local baniya who might sell at cheaper rate but the quality must have to be compromised. The same oversight should be applied when investing in equity partnership. When you're considering investing in equity, evaluate the character of the promoter or manager. What is their background? How have they grown their business? How committed are they? What kind of vision do they have? Do they have the ability to execute their vision Into business reality. Most importantly, check their track record on how they treat minority shareholders. All this information is easily available today on the internet. Sites like watchoutinvestor.com. news archive on google.com and others can help you take a good call in identifying the right promoter. Don't compromise on choosing your partner, and half your Job is done. Warren Buffet said that when a good manager meets bad business, it is usually the business that wins. So the other job after finding a promoter of sound character is to ensure that he has the right people running the business. The CEO and the top management must have very good record without any wrongdoings in their career. They must be from good academic background and should be known in their industry. The next thing to look for is how strong the business is. Legendary fund manager, Peter Lynch, mentions in his book an incident where seasoned fund managers were pitched against kids in picking up stocks. To everyone's surprise, the kids won against the fund managers by a handsome margin. This happened because the kids picked up stocks of companies whose products they were using. One can make a pretty good business call, based on sheer common sense and the power of observation. Companies having a wider presence across channels and having a pricing advantage compared to others (e.g., Apple) are bound to outperform others. The next thing to look for is Industry structure. In case of highly competitive industries, companies require huge efforts to maintain their edge. But if the business model is such that it is not easy for other companies to replicate the company then the company inherently has built an advantage. Also some industries are very much influenced by prices. For example, FMCG companies have very little room to raise prices as such a thing will crush their sales. On the other hand, companies have more say in industries like Pharma, real estate etc and buyers have very little power. In case of highly competitive industries, companies require huge efforts to maintain their edge. But if the business model is such that it is not easy for other companies to replicate the company then the company inherently has built an advantage. The next most important thing to consider is the financials of the company. Look at how the stock is valued relative to peers, how company’s revenues are growing, whether the financial results are released on time or there is unnatural delay regularly, whether the accuracy of the financial statements is good or not. Also important is how the company’s profit margins are relatively to the peers and the debt level. Debt level may not signal anything on standalone basis. See how the debt compares to equity and compare to peers. Unsustainable debt equity maybe a bad sign and lead to bankruptcy. There is no harm in missing an opportunity in businesses that one doesn't understand. A legendary investor like Warren Buffet has not benefitted much from the bull run in technology stocks, even though he shares a close friendship with technology czar Bill Gates. Observing day-to-day consumption in the market can give you a good view on businesses. A change in the pattern of consumption, like from scooters to motorbikes, if picked up early enough, can help you make big money. Many a times, talking to channels that are engaged in the business can help you validate your views. For example, a chemist can easily tell you about a pharmaceutical company's products. A grocer can tell you about a Fast Moving Consumer Good (FMCG) company's products. Surfing the internet can also provide a great deal of information about a business. It is important to know about the business and its cycle. The combined knowledge of the business and its promoter can help you identify high-potential stocks, which can compound your wealth.